This is just a quickie for the challenge! I really struggle with circle cards, as well as symmetry can stress me out sometimes too! but I gave it a shot. 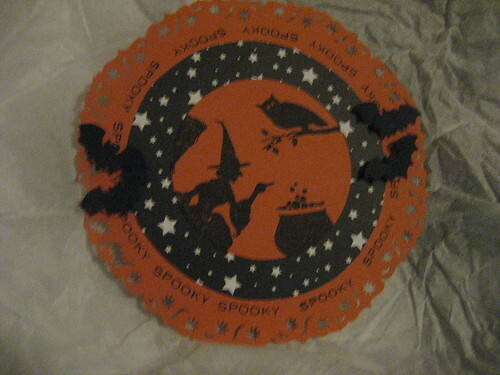 I used Waltzingmouse stamps to make the little scene, from the Halloween party stamp set. I used the Martha Stewart bat punch to make the bats, and the black star paper is from Papertreyink’s “Halloween Prints” patterned paper. The edge of the circle is a Fiskars punch, not sure which one! This entry was posted in Craft challenges. Bookmark the permalink. Thanks for your offer on Vera’s site. Although it will take a while for the hospital in singapore to get the AFOs from Cascade, we’ll go through them simply cos we can pay for it by a medical fund. Spooky indeed! The punched edge is awesome! Love how the black silhouettes look against the orange! Awesome Halloween card! Hi Lee! cracking card!!! I love the wee scene you created! and the starry border! AND the punched edge! loads of fabby details! Thank you so much for playing along with us at Waltzingmouse Stamps! Fun halloween card! I love the punched border!